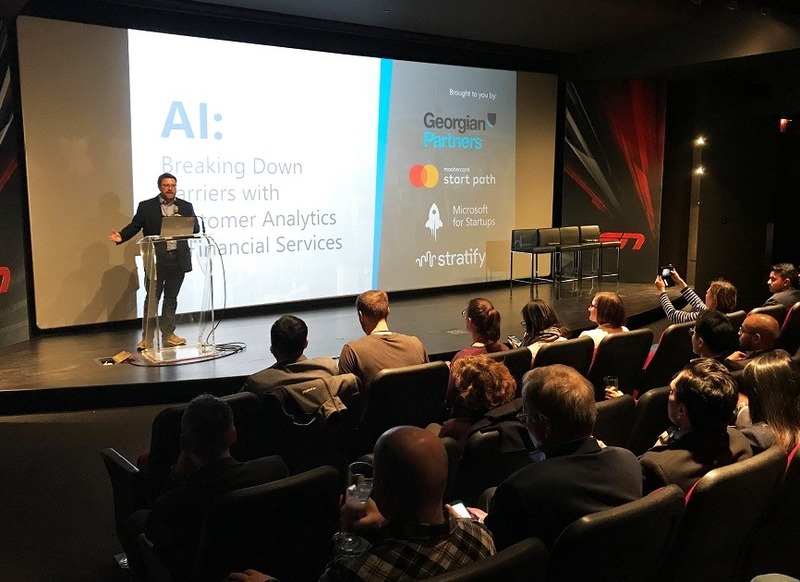 Speaking to a group of AI enthusiasts and entrepreneurs at Toronto’s Hockey Hall of Fame, AI analytics company Stratifyd hosted a panel discussion with venture capital firm Georgian Partners and representatives from both Microsoft’s and Mastercard’s respective startup programs. The event, looking at data creation velocity and volume, asked questions about how people can make better decisions with large amounts of data leveraging AI. Sharing honest views on the hype versus reality of AI, the talks offered examples of AI’s strong points, its shortcomings, and how the corporate world can support companies with high potential. There’s no such thing as products anymore, just experiences, said Tyson Baber, partner at Georgian Partners, in the opening talk of the night. His underlying message was that society focuses so much on a great purchasing experience that it has become a deciding factor for buyers. Knowing that, Baber posed the challenge of AI not as replacing humans but as digesting massive amounts of data to make the right buyer experience decisions in an instant. When Derek Wang, CEO and founder of Stratifyd, gave his introductory speech, he echoed Baber’s point but added a conundrum. AI is here to augment our human intelligence, said Wang. But to build AI that augments intelligence, you need data and a training model. While Wang talked about the training model being the “scary part” for non-data scientists, Jose Gutierrez, director of digital payments and labs at Mastercard, later said that he felt data was the real problem. In the early days of AI there was a lot of hype created around CRM systems and marketing, Gutierrez said. Particularly in financial institutions, the pendulum swung a little too far. Banks perhaps invested a little too much in state of the art tools and not enough on making sure the data is standardized and can be digested by these machines. Kevin Odell, CTO of Stratifyd and moderator of the panel discussion, agreed, noting that if there’s garbage data going in, there will be garbage insights going out. During his talk, Wang shared tangible examples of how AI is used not to replace humans but empower them. In one case, an auto manufacturer experienced a dip in customer satisfaction ratings but couldn’t identify why. Conversational analysis, powered by AI, identified trends with owners who took unstructured feedback phone calls but did not fill out a survey. The results identified small issues in the manufacturer’s process that caused nuisance and discomfort for owners. Armed with these insights, the manufacturer was able to address the issues quickly, but more importantly were able to pinpoint the exact cause of customer dissatisfaction to salvage the customer relationship. On the flip side, this Fortune 50 financial institution had a small team dedicated to reading and extracting insights from surveys, reviews, and unstructured customer feedback. They were getting good insights, but the team was burning out from the time and effort spent. AI was able to digest the same data in a tiny fraction of the time, providing insights the team could execute on instead of spending more time analyzing feedback. During the panel discussion, Gutierrez brought up the topic of cyber security and fraud mitigation as another key area for AIs potential. Stopping fraud in digital environments is about embedding as much data as possible in the transaction, Gutierrez said. For example: the angle you hold your phone, your altitude above sea level during the transaction, how quickly you type, how hard you type, your biometrics like face or thumb, your unique device IDs, and more. All this data sounds like an AI-nerd’s dream, but the reality is that combing through that data is impossible for humans when you factor in how quickly transactions happen. But when you have 150 data elements for every transaction, that’s a ton of data processing back and forth, Gutierrez continued. And decisions need to be made in real time. Banks need to know in milliseconds to accept or deny that charge. AI has been around a long time, said Adam Nanjee, managing director for Microsoft Startups in Canada. Netflix has been recommending, using AI, for a long time. Same with Amazon. What Nanjee found particularly interesting – and high potential – is how some startups are helping other companies access AI more easily. We’re now seeing companies building AI-as-a-Service, Nanjee said. They can leverage company’s AI toolkits and build it on top of their applications. The customer acquisition level is precisely where Microsoft, Mastercard, and other corporate startup programs hope to play. Both Nanjee and Gutierrez said that their respective programs are not VC funds and don’t help with hiring or technology development (though Microsoft’s program gives access to its technologies including Azure). Instead, both companies hope to act as a connector, leveraging their global networks and brand influence to help AI startups find the right early customers for their solutions. As Gutierrez said, programs like Mastercard’s are “matchmakers” where the company makes the introduction but the startups have to sell themselves. This type of support comes in handy for AI companies that help humans better serve other humans, as Odell chimed in with a statistic from Forrester Research that there is a $1.2 trillion dollar global opportunity for companies that focus on insight-led customer experience over those that don’t. In order to get to that opportunity, though, Nanjee said the key is education. There’s a gap, Nanjee said. Many people don’t know what AI is let alone its potential. We’re all about empowering the plan to achieve more through AI, so how we do go a level deeper and get really granular to educate people on what AI is?